You and your best friend like nothing more than to spend time together strolling in the great outdoors. It is a special time and is a very relaxing way to relieve stress and wind down after one of those days. The call of the open track and field is too much to ignore and it can be a special bonding time not just for you and your pet, but also for your friends and family too. We spend so much time indoors working for a living or maintaining the smooth running of our homes – it can be easy to overlook the simplest of pleasures we have close to hand. Sometimes it bears no relevance to what we get up to, but when we do partake in the outdoors, the pleasure and benefits outweigh even the most inclement weather. In this update, you will find the best scoopers you are looking for to clean up your dog's business. They will be even easier to find since we linked each product right to where you need to go. In addition, we enhanced the readability, and as always you can find useful information for what type of pooper scooper to get, other features about them and see some answers frequently asked questions. We have the benefit of being able to prepare before we go out, but let’s face it – the main reason for going on the daily walk with our furry pals is so they can relieve themselves. Unfortunately, as much as we can help them to train and be obedient, toilet training is simply not a doggy option. Wouldn’t it be great if the dog poop bins could be replaced with dog toilets! Life would be so much easier, at least in theory. But back to the real world, our beloved pets do need the walk and they do need to poop. A good way of taking at least one positive from this is the fact that they don’t generally do it all over the house. But we, as responsible humans know we can’t just look the other way and pretend that it was somebody else’s pooch who left the present on the sidewalk or in the park. We have to look at the bigger picture and imagine the scene if nobody cleaned up after their dog. Not only would all of our walks be tackled with unease, but we would spend more time looking down to dodge the inevitable packages that we would fail to be able to enjoy the walk. So, we take measures to make sure we clean up after our beloved animals to ensure the continued joy and pleasure of a good walk well into the future. Next question inevitably will be about how to clean up your dog without too much contact and possible contamination to yourself? This review will look into some useful aspects of various methods of tidying and rate the top three accordingly. The remaining seven reviews will cover most preferences and budget so you never have to worry about scooping the poop again. The complete list below is a sample of the best pooper scoopers on the market, and some are well known reputable brands that you may recognize. The list is reflective of a wide variety of manufacturers and products, and this is so you can have a broader overview of the different types on the market before you make your final decision and your purchase. Gone are the days of using the doggie bag and your hand. 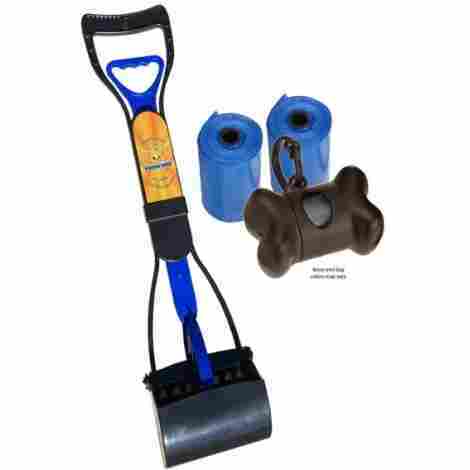 This Petmate Arm & Hammer pooper scooper is stored away easily when not in use, it has the benefit if having a swivel action bin function that allows quick access to pick up from a variety of angles. It has a rake design end that boasts being suitable for most surfaces which improve its functionality further. It is fabric free and is easy to keep clean and sanitized, a must when those accidents occur. 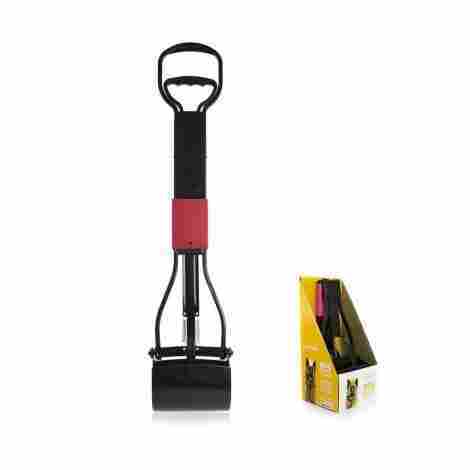 The pooper scooper has easy snap together poles for quick and easy assembly and takes down for storage, and the handle can adjust to up to 32 inches to enable ease of picking up. The bin capacity size for multi-pet households. The scooper comes with odor control bags in a pack of two, these bags simply attach with a hooking system on either side of the bin. They are activated with baking soda and tie easily so there is less risk of coming into contact with the waste. The overall balance between cost and value of this Petmate Arm & Hammer pooper scooper is even and justified. The easy to use design and complete securing mechanism makes it an ideal purchase for anybody who has to deal with cleaning up after their pet every day. The Petmate Clean Response pooper scooper benefits from a large capacity swivel bin for households with large or multiple pets. It has a raked design and the collection end of the handle and boasts being suitable for use on any surface, so there are fewer requirements for separate scoopers for different areas. It has the versatility in the way any bag of the correct size can be used to collect the waste, and as a good benefit, it has gripper handles that ensure it is comfortable to hold. The handle is designed in an ergonomic fashion to alleviate back and leg pain, the extending handle reaches up to 3 feet so there is less requirement to bend and stoop when scooping. The swivel bin makes scooping convenient at most angles. The scooper snaps together easily and quickly, and when the job is complete; it snaps back down to a convenient size for compact storage. The ability to use any bag makes it more cost-effective because it reduces the cost of purchasing specific bags. When taking into account the ergonomic value and the cost-effective use of materials, this Petmate Clean Response pooper scooper is a great value. The versatile rake makes it suitable for all surfaces and reduces further costs, this product is excellent value for money. This neat pooper scooper is mechanised with a spring-loaded trigger for ease collecting the waste, the single-handed use is an efficient grabber with minimum effort. The overall height of the scooper is 25.5 inches in length and gives good reach to reduce back pain from bending. The serrated edges make it ideal for use on any surface and this makes it functional and practical. 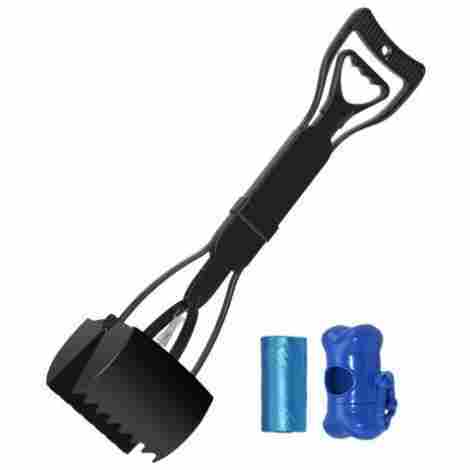 This pooper scooper is both useful and tough for long-term use that raises its overall value. The design of the Dogit Jaws Waste Scoop is ergonomic, making the handles soft and comfortable to hold. Incorporated into them are rubber pads which are specifically in place to increase the comfort during use and improve grip. The durable scooper is made from practical lightweight material that is easy to clean and store without fear of rusting when not in use. The easy to use handle makes it versatile and useful for average heights and can be particularly handy for users with limited mobility. The Dogit Jaws Waste Scoop is, on balance equally great on both value and cost, the functionality and versatility it offers, combined with the easy grip mechanism and cleaning, ensure money spent on this product is money well spent. 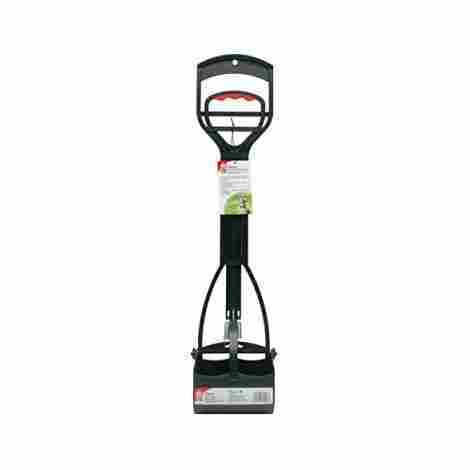 The neat Monster Pets Nature’s Miracle Advanced Jaw comes in medium and jumbo options, the lightweight, practical scooper boasts being capable of collecting from grass, gravel, and concrete. Its stylish color is produced using easy clean, non-stick plastic that offers antimicrobial protection. The trigger grip action makes cleaning up a breeze, allowing touch-free disposal. The two sizes benefit from choosing a more appropriate size for the waste expected, therefore reducing the amount of time emptying the bucket. The overall weight of the Monster Pets Nature’s Miracle Advanced Jaw is a mere 2.08 lbs and that means less pressure on the wrist through weight bearing. 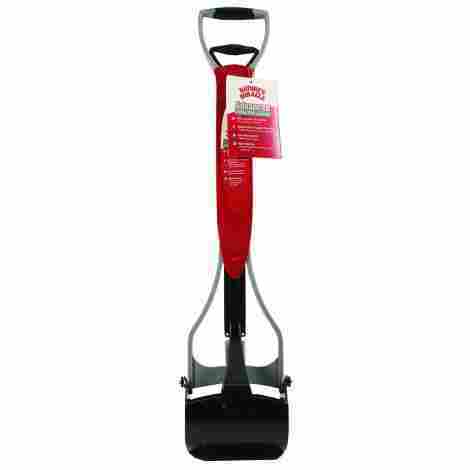 The height of the scooper is a tidy 32 inches so should offer more than adequate sizing for most people. The materials used in the manufacture of this scooper means it can be left outdoors in all seasons without the fear of product degeneration. The useful jaws have teeth to enable easier cleaning on grass and gravel, meaning less time spent on the leftovers. The practicalities this Monster Pets Nature’s Miracle Advanced Jaw offers, combined with the features like the teeth and easy grip action, make this equally beneficial and ensures money spent on this product, is money well spent. This convenient scooper is designed to literally scoop the poop directly onto the rake, giving it a benefit of being bag free and more environmentally friendly. The durable scoop has a comfortable rubber grip so there is less possibility of wrist ache through flexing. It boasts being totally rust free and should be suitable for outdoor storage all year round. The rake means it can be used on a variety of surfaces including grass, stones, and even gravel. 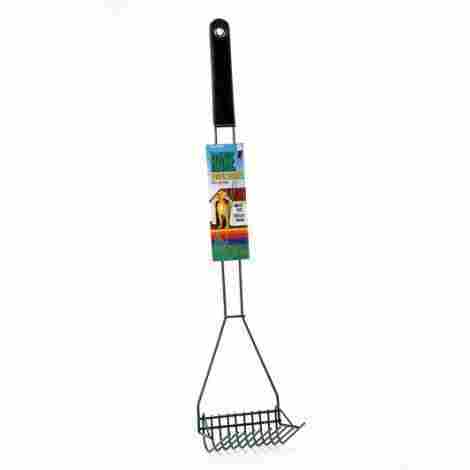 The height of the Four Paws wire rake scooper is a practical 29.5 inches, the robust design is easy to use and is extremely light to hold. The scoop enables mess-free disposal – simply tip into a waste bucket and rinse ready for the next use. The prongs on the rake are about ½ inch apart and this allows for even smaller waste to be scooped effortlessly without leaving traces and droplets. It boasts being good at not tearing up the neatest of grass gardens due to the measurement between the spikes. This basic and effective scooper does exactly what it says it will without any drama, it is multi-surface friendly and won’t leave tracks when collecting waste. On balance, the overall cost in relation to the value is equal and this product is great value for money. 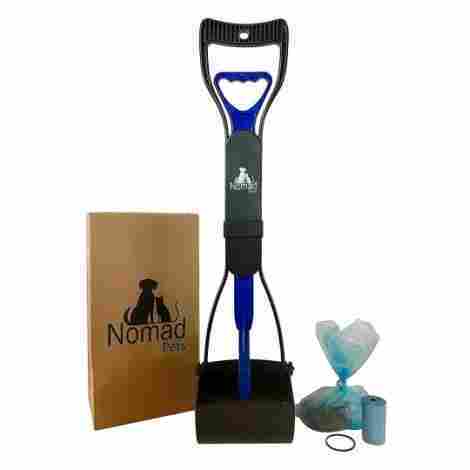 This Nomad scooper boasts being practical enough to use without leaving a mess behind, the action performed allows the poop to scoop straight into a poop bag so ensures a total mess and hands-free tidy. It is manufactured using a dual-coil tension method that gives perfect control of the action. The hand grip is shaped into a comfortable arch so fits nicely in the hand without twisting and reduces wrist aching from multiple pickups. The scooper comes with a rubber band for extra security around the bag and so reduces risks of spilling. The bags fit neatly over the scoop and this keeps the exterior cleaner for longer and traps odors within when it is secured. The Nomad scooper has strong serrated teeth which picks up waste of most sizes with ease. It proffers to be able to collect waste from a variety of surfaces including grasses, leaves, and concrete, the easy tie bags make removal effortless. The appealing cost of this scooper is appropriate for the service it enables, the inclusion of a fitted band to secure the poop bags serves to increase the value. On balance, for the money paid for this product is justified and it is good value for money. Owners will appreciate the rubber band feature. The bag does a great job at trapping odors. The device is made with strong teeth, making it easy to pick-up poop. Consumers have complained that the product is relatively small, which makes it difficult for people with bad backs. The Bodhi Dog complete poo pack is an ideal starter for tidying up after the family pet, it includes a scooper, a holder, and bags. The height is a tidy 24 inches so reduces some need for overbending, it has two high tension springs to ensure sound clamping during use. It boasts being usable on grass, gravel, concrete and other surfaces without leaving traces and spillages. It has a large bucket so will require less time spent emptying the daily waste. The ergonomic finger slots located on the handle give maximum comfort during use and reduce strain to the wrist, arm, and back. The Bodhi Dog scooper is easy to use and is capable of collecting most poop from most surfaces and this increases its economic value. The compact size means this scooper is practical even when not in use, it stores easily and is easy to clean with a simple rinse. The bag holder gives it more practicality because everything needed for a clean scoop is provided within this pack, making scooping less time-consuming. The Petphabet pooper scooper is a tidy unit that is foldable to enable quick and easy storage when not in use. The design is such that picking up the waste is easy to do with one hand, the comfortable handle and pull trigger are practical in use with contoured finger grips. It offers springs with more than adequate tension to ensure a clean and tidy pick up every time it’s used. The scoop has teeth and is made so it is easy to rinse and keep clean, and also boasts being able to collect both wet and dry poop which is always a practical bonus. This scooper offers the ability to collect waste from multiple surfaces including both grass and concrete. The easy use pulling action is designed to be firm enough to pick up, but not too firm to cause hand and wrist ache. The Petphabet pooper scooper is produced using antimicrobial plastic that is easy to keep clean after use, and when stored properly the springs will not rust. It benefits from being able to collect multiple poops in one go which means less time bending and emptying. 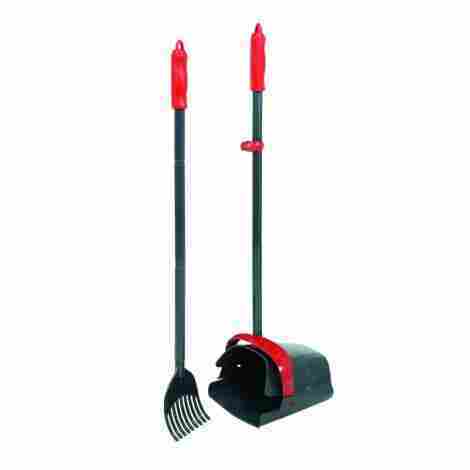 This pooper scooper is reasonably priced when considering the quality of the production and the added features such as the contoured finger grips and fully closing bucket. On balance, this product is very good value for money, and it is available in a good choice of colors. This 28-inch pooper scooper boasts being produced using tough, hardwearing and long lasting materials that go on and on. It has a large jaw clamp that is capable of collecting any sized waste – from small to large without fuss. The Paws & Pals Jumbo pooper scooper has serrated teeth on the jaw that benefits the ability to clean up on most surfaces including sand, snow, grass, mud and more. The size makes it practical to clean up more in one go and therefore reduces time spent emptying the waste build up. The manufacturing process of this scooper proffers to use high-quality rust-proof aluminum and even industrial grade plastic. This ensures the scooper will be able to withstand tough day to day use and should be durable enough to last longer than some rivals. The Paws & Pals scooper has a comfortable ergonomic design that makes it practically effortless to use, it reduces strain to the back and knees and enables collection even with restricted mobility. The simple, no fuss method of scooping means the job is less of a chore to complete on a daily basis. The benefits of the comfortable handle and ease of scooping make this unit a sound investment for any garden that needs cleaning on a regular basis. The simple, hassle-free method and size of the scoop ensure it is a great value and will be money well spent on a good, practical scooper. The QUMY 24 inch Pet Pooper Scooper benefits from a longer handle that will prevent potential back, arm, and leg pain. It has a dual-recoil tension controlled scoop that enables full control over the task at hand, the movement proffers to leave no mess behind. Bags fit neatly over the scoop so there is no requirement to handle the waste, the scooper is easily and quickly cleaned to maintain hygiene. It is light to hold and the mechanism is designed to make it super easy to use even with restricted mobility or movement. The practical way this scooper collects waste directly into the poop bags increase its overall practicality, it boasts being able to collect waste from almost any surface – even including leaves and grass on the can-do list. The ease of use is complemented with an arched hand grip. The QUMY 24 inch Pet Pooper Scooper is manufactured with quality materials and long-lasting plastic that has serrated teeth on the bucket and is non-stick, so even if there is a mishap – there is no requirement to touch the waste, it will simply rinse off for convenience. The quality of the product and the durable materials used in the production of this pooper scooper, mean that money spent here is spent well. The overall balance between cost and value is relevant and justified by the longevity the manufacturers offer upon purchase. So, we know it’s a dirty job but it does really need doing. Pooper scoopers are thought to be the brainchild of Brooke Miller, of Anaheim in California, her rudimentary design was simple but effective. As awareness and scientific knowledge became more prominent, it is now (or should be), almost second nature to clean up any poop left by your favorite furry friend. The downside to this is, of course, the element of getting over the distaste of handling waste, we don’t, of course, do this for pleasure but for necessity. When we take into consideration all the hidden nasties that can be created from leaving poop behind, whether that be simply the odor. The disgust when we tread in some and carry through the house or into the car can be considered small fry when the health implications are taken into account as well. The bacteria found in regular dog poop is largely E Coli, which as most of us are aware is a potential health hazard not only in its pure form but also as a run on through getting its way into the earth and water supplies. This may sound a little over the top and you may be thinking how can my dog cause that, true, one dogs poop waste will not cause general hazards. But when you multiply your dog’s poop with every other dog in the neighborhood it can be easier to take in the health implications to us and them; now and in the future. Of course, the pros obviously and rightly outweigh the cons, a few moments of your time each time your dog poops will make each next time you go for a walk – that much more pleasurable. And for that small bit of time each day, you are doing yourself, your dog and your community a great service. Of course, an obvious run on from this is what do you use to scoop the poop? There are options available and it does depend on your budget and the size of your dog. A basic method is the trusty poop bag, it is simply a bag turned inside out to pick up the poop without touching it, then secure it and place it in a specific poop disposal unit. This can be an effective method if you are on long walks or have limited carry space or mobility. The downside is, of course, sometimes the bags split, and there’s nothing worse than having that bag with you for hours whilst you wait to come across the correct bin to dispose of it in. Another type is the handled pooper scooper, these come in an array of designs with different features. There are types that come with self-dispensing bags so they automatically slide into a tray, then the handle is pulled to rake or push the poop into the ready bag. Great so you don’t have to get too close or bend too much to do the job, some even have the capability to secure the bag as well. The handled types come in various lengths and you should check they are compatible with yourself, some are short handled by design, but you can get telescopic or adjustable handled scoopers so they can be used by anybody who takes the dog out. 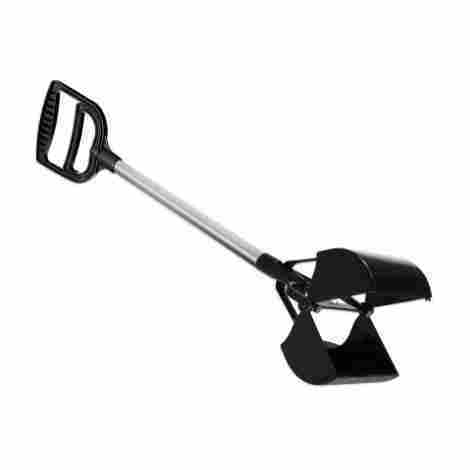 Basic pooper scoopers have a simple tray, either plastic or metal, and will have either a rake or shovel-shaped fitting on the end to enable easy scooping. These will require you to either put a bag around it yourself or simply go bag free and wash after use. Of course, where you want to use your scooper will need to be considered too, it’s not going to be much use to buy a hands-free set if you can’t bend easily to get to the job. And likewise, if you are going on a particularly long walk in the back of beyond, maybe the last thing you want strapped to your backpack is a handled pooper scooper. You need to consider materials too when you are looking for your ideal pooper scooper, it is fast becoming clear that many plastic bags do not biodegrade and manufacturers are working on this with improving technology. It may be an option to use paper bags or some other recyclable material that won’t harm the environment after you scooped and bagged your poop. Metal can be an ideal material to look for, especially if you won’t be using your scoop on a regular basis, they are easy to clean and can be stored outside with the gardening tools. Aluminum and stainless steel will last longer and will there-fore be more cost effective in the long run. You may also want to choose carefully the actual scoop size, especially if you intend to take your scooper on days out. You may only have a small dog, or a large dog – or more than one, it’s best to at least try and gauge the size you need before you buy. You don’t want to be weighed down with a heavy scoop for long periods of time whilst you are on a day out. Modern plastics and other man-made materials are another option, these are lighter than metal scoopers, have more variety and are recyclable. They are available in many forms, and some even incorporate metal scoops for extra durability. Plastic and nylon alternatives are easier to handle and carry than their solely metal counterparts, but they can be more brittle and are not generally sturdy for rough terrain scooping and weather/temperature changes can make them brittle or soft causing snaps and breakages. Q: How do I dispose of my scooped poop? A: You can put the bags into specific trash containers that are designed for the purpose, these enable the waste to be treated and disposed of safely. There may be options for collection services from your property; but you would need to check in your locality for choices, availability, and prices. You shouldn’t place your scooped poop into regular waste disposal because of potential harm to recyclers and sifters. Q: How much poop can a scoop hold? A: That depends on a variety of reasons, first the size of your dog and the size of the scoop are important to take into consideration. Most modern scoops can handle multiple poops but you should consider your dog’s regular habits when you make your purchase. Q: Do I need gloves for a handled scooper? A: As a general rule you shouldn’t need gloves, the purpose of the handled scooper is to assist in both the collecting and storage of waste so your hands needn’t come into contact with the business end. Of course, this is down to personal preference as well, so if you feel uncomfortable full stop when scooping, gloves may be ideal for you. Q: Are all scoopers ok for use on hard surfaces and grass? A: That depends slightly if the grass is short and tended, then most scoops should work on both areas. 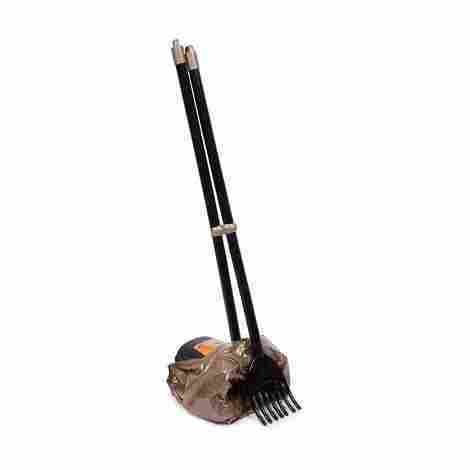 However; for longer grass areas you can purchase grass rake scoopers that are designed to sift the poop from the grass and then deposit it into the bag. Q: Is a handheld option better than a longer version? A: This is up to personal requirements, a hand-held scooper is often shorter in length and will, therefore, mean bending to scoop, an upside is that the carrying capabilities are often larger so you can pick up more with less time emptying. Q: Is plastic better than metal? A: Metal scoopers may be either aluminum or stainless steel and will be heavier than a plastic model. You need to weigh up the opposing pros and cons before you buy though, they may be heavier than plastic but they do tend to be more hard wearing and are more durable. Plastic scoops are lighter, sometimes easier to handle and are quick to clean and sanitize. Q: Do I need to use two hands to work my long-handled scooper? A: Most modern scoopers are comfortable enough to use one-handed, they may have a spring-loaded action trigger which allows you to place your scooper, and activate the scooping action at the same time with one hand. TheLabroadorSite, Check Out The Very Best Pooper Scooper Options Here!